Saturday, November 14th, 10AM-7PM @ the HackerDojo at 140A South Whisman Road in Mountain View, CA. We'll be in the space labelled Savanna on this floor and the space labelled Deck on this floor. RSVP at the facebook event if you like. Please bring your own tables and stands for setting up your synthesizers, as well as enough power strips such that you only use one outlet. Headphones are encouraged, but we know the temptation is there to use speakers so that everyone can hear. Please no PA systems or loud keyboard amps, keep it at a reasonable volume for the sake of everyone's hearing and sanity, thanks. Parking is plentiful, but restricted, please see this diagram for where parking is allowed in the adjacent lot. Discreet alcohol in moderation is allowed. Load-in through the roll-up door. Our yearly Moog Foundation raffle is a go with wonderful donations from the Foundation itself and Analog Haven, among others, so bring your cash and any items you wish to donate for that. 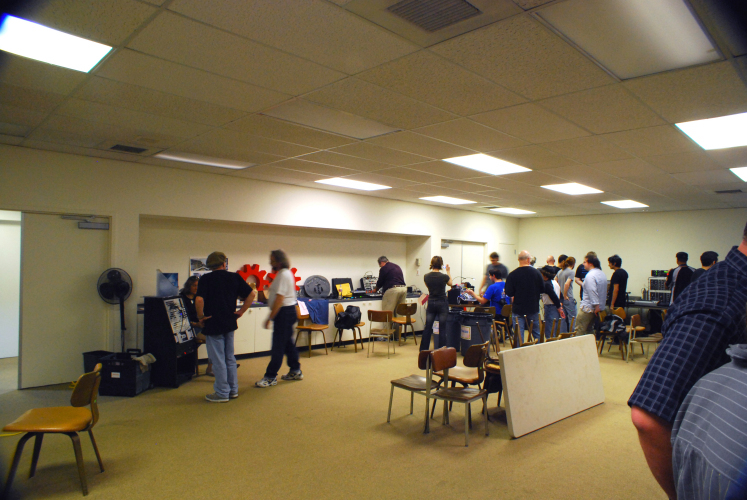 It would be nice to donate some amount you can spare to the HackerDojo for their generosity in allowing us to use their space for the day. We will take collections and bundle a donation in AHBA's name. There are plenty of eating establishments in nearby Mountain View, here is a map of what is available. For those who've never been to one of our events, here's a directory of photo galleries from previous years, it's a fun-pass filter. Mailing List: AHCali, where we discuss matters related to this gathering, and hopefully others in the future.